Join Perkiomen tours for a day at Mt. Airy Casino in the Pocono Mountains of Pennsylvania. Drop your dime in the Jukebox and make your selection because Jukebox Broadway is a musical treat for all! Dabble in a little casino slot play, get your fill at the scrumptious lunch buffet and jump and jive in your seat while watching "Jukebox Broadway Starring The Diamonds" - everything is included! Sit back and travel with us to the beautiful Pocono Mountains. At the Mount Airy Casino, you can use your included slot play dollars, indulge in a never-ending lunch buffet and see the entertaining Jukebox Broadway Starring The Diamonds show that will have you reminiscing as you jump and jive in your theatre seat! From 1957 The Diamonds released their million selling hit, "Little Darlin". From then, they have received three gold records, 33 appearances on American Bandstand, the Vocal Group Hall of Fame, and Doo-Wop Hall of Fame. The Diamonds are now showcasing their brand new show, Jukebox Broadway. The Diamonds will perform 25 songs from 15 of Broadway's most popular jukebox musicals such as: "Come Fly With Me", "Smokey Joe's Café", "Beautiful", "All Shook Up" and "Jersey Boys" to name a few. Drop your dime in the Jukebox and make your selection because Jukebox Broadway is a musical treat for all. 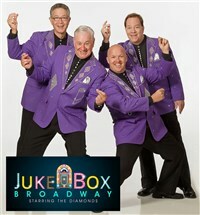 3:30 PM Show - "Jukebox Broadway Starring The Diamonds"
The casino requires each person to present a government issued photo ID to receive the bonus slot play package. Motorcoach seating is assigned at the time of reservation but can not be guaranteed. Although we do our best to keep each traveler in the seat assigned at the time of reservation, there are times that it is necessary to move seat locations. Please be sure to verify your final seat number(s) with the driver at the time of boarding.